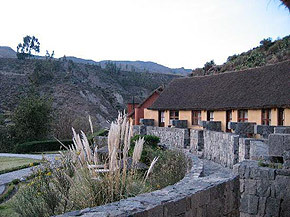 We invite you to feel the energy of one of the most spectacular areas of southern Peru: Valle del Colca. A place where the river joins with the sky, the sun and the moon and the mind with the body. A site with history and friendly people, preserving their traditions, their myths and spirit. 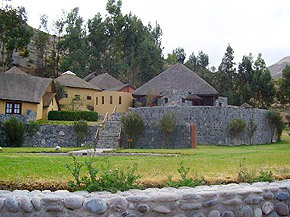 Located at 3.250 m and 2.5 hours from the city of Arequipa, our hotel is nestled on the banks of the Colca River, surrounded by hundreds of pre-Inca terraces Cultural Heritage of Peru and blessed with relaxing thermal waters rich in lithium. 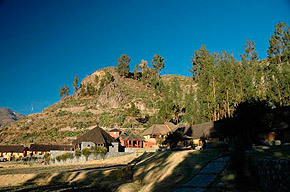 Among the services Colca Lodge offers guests outstanding, no doubt, its thermal baths. Built in a natural environment, by the river, the three thermal pools are fed by a primary source whose temperature is 80 degrees Celsius. In the area of ? ?thermal springs are male and female dressing rooms and restrooms. Also offers a bar and a country restaurant where we serve the BBQ beef and trout. The hotel also has a full Thermal ECO-SPA which offers a variety of massages, facials, wraps, whirlpool and steam chamber. Colca Lodge has safes in all rooms and at reception. It also provides nursing services, telephone and internet (at reception) and room service. The hotel has three restaurants and two bars with wide selection of foods and beverages. 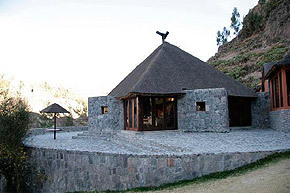 Colca Lodge has the privilege of being located in a very special place, situated in the midst of pre-Inca terraces at the foot of the Colca river. The 45 rooms offer our guests have a wonderful view over the valley and are located around the gardens and squares that make up the hotel. Are in rustic style with thatched roofs and some have mud walls to keep the temperature and work with the environment. Currently we are implementing a heating system "clear" that operate using geothermal energy with which the hotel. Similarly, hot water baths is generated by solar systems. The bathrooms are small but complete, always with a twist for you.